Home » SWIFT, LOUIS F.
Louis was the son of Gustavus Swift Sr., founder of Swift and Co. With his brothers, he developed Swift & Co into a $1 billion a year business, eventually becoming Chairman of the Board of that company. LOUIS SWIFT. DS. 2pp. 8 1/2" x 14". April 27, 1912. 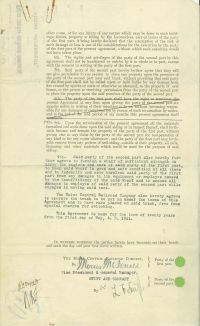 A partly printed agreement signed "L F Swift" between Swift and the Maine Central Railroad to have additional railroad track built at the end of the so-called "Armour track". It is in fine condition with two rust marks at top and one rust mark at bottom from paper clipping; they do not affect the signature.